Golden Hour received widespread acclaim from critics, winning in all four of its nominated categories at the 61st Grammy Awards, including Album of the Year and Best Country Album. The album's first two singles, "Butterflies" and "Space Cowboy", also won awards for Best Country Solo Performance and Best Country Song, respectively. Golden Hour also won Album of the Year at the 52nd Annual Country Music Association Awards. Musgraves wrote and recorded most of the songs from the album throughout 2017; about the writing process she said: "I have a lot more love songs this time around, and I've never been one to write a love song and really feel it." She continued: "That probably sounds like the most depressing thing ever. [But] I'm coming off getting married and being in this golden hour of my personal life, where all these things are finally coming to fruition. I found myself inspired to write about this person and all these things he brought out in me that weren’t there before." Some of the album was recorded in a studio above a horse stable owned by musician Sheryl Crow. On March 10, 2018, Musgraves announced the Oh, What a World Tour in support of the album while performing at the Country to Country music festival in London. The first 12 dates of the tour were announced on March 12, with Musgraves stating on social media that tour dates in other countries would eventually be added. The tour began on October 13 in Oslo, Norway. Golden Hour received widespread acclaim from music critics. At Metacritic, which assigns a normalized rating out of 100 to reviews from mainstream critics, the album has an average score of 89, based on 17 reviews, indicating "universal acclaim". Stephen Thomas Erlewine of AllMusic rated the album four and a half out of five stars and called it "warm and enveloping, pitched halfway between heartbreak and healing-but (it) lingers in the mind because the songs are so sharp, buttressed by long, loping melodies and Musgraves' affectless soul baring." Writing for The Independent and rating the album a perfect 5 out of 5, Roisin O'Connor states the album is "a reminder that sometimes – often, if you're looking in the right places – life is beautiful." Additionally, it was a Spin "Essential" and of the genre-bending songs on the album, reviewer Katherine St. Asaph calls it "not classicist, but perhaps it might be classic." The album was rated number one by the BBC poll of polls, a compilation of 'best of the year lists' across 35 music reviewers, on a list of the best albums of 2018. The album also placed number one in The Village Voice's Pazz & Jop critics' poll for 2018. 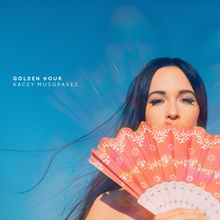 Golden Hour debuted at number four on the US Billboard 200 and at number one on the Top Country Albums chart with 49,000 album-equivalent units—39,000 of that figure being pure album sales. It marks Musgraves’ third number one on the Top Country Albums chart. It also debuted at number one on the Americana/Folk Albums chart. In the chart week following the 61st Grammy Awards, where Golden Hour won Album of the Year, the album sold 35,000 copies and climbed to number 9 on the Billboard 200 chart. The album has reached 310,000 in equivalent album units by February 2019, and the album has sold 206,100 copies in the United States as of April 2019. ^ Annie Reuter (February 12, 2019). "Kacey Musgraves' 'Rainbow' Shines at Country Radio Following Grammy Performance and Wins". Billboard.com. Retrieved February 19, 2019. ^ a b O'Connor, Roisin (March 28, 2018). "Album reviews: Kacey Musgraves, The Vaccines, Kate Nash, Frankie Cosmos, Sons of Kemet, Mount Eerie". The Independent. Retrieved March 28, 2018. ^ Christgau, Robert (January 12, 2019). "Robert Christgau on The Delines' Depth and Kacey Musgraves's Quiet Sell". Vice. Retrieved January 17, 2019. ^ a b "Pazz & Jop: The Top 100 Albums of 2018". The Village Voice. February 6, 2019. Retrieved February 12, 2019. ^ Variety staff (February 10, 2019). "Grammy Awards Winners: The Complete List". Variety. Retrieved February 10, 2019. ^ "2019 ACM Awards: The Winners List". The Boot. April 7, 2019. Retrieved April 7, 2019. ^ Caulfield, Keith (February 17, 2019). "Ariana Grande's 'Thank U, Next' Debuts at No. 1 on Billboard 200 Chart With Biggest Streaming Week Ever for a Pop Album". Billboard. Retrieved February 17, 2019. ^ Coscarelli, Joe (18 February 2019). "Kacey Musgraves on Celebrating Her Grammys With Mick Jagger and a Chicken Sandwich" – via NYTimes.com. ^ a b Golden Hour (booklet). Kacey Musgraves. MCA Nashville. 2018. B0027921-02. ^ "Top Country Albums – Year-End 2018". Billboard. Retrieved February 24, 2019.